In this area of the Apparel Search fashion brand directory, you will find Men's fashion brands from leading apparel companies and fashion designers. On this particular page, you will find information regarding Men's clothing with the Ted Baker brand. You are welcome to utilize this section of our clothing guide to review Ted Baker news, Ted Baker blog posts, Ted Baker photos, and more. Please understand that you may run into a few photos or a tad of information that does not actually pertain to the Men's Ted Baker fashion brand. Unfortunately, no search technology is absolutely perfect. We will continue to do our best to bring you as much information about the Men's Ted Baker fashion collection as possible. Ted Baker plc is a British luxury clothing retail company. Ted Baker's founder and CEO, Ray Kelvin, started his first store in March 1987 in Glasgow, and opened further stores in Manchester, and Nottingham. In 1990 Ted Baker opened a store in Covent Garden and Kelvin bought the company outright from part-owners Goldberg and Sons. Today Ted Baker is a global lifestyle brand offering menswear, womenswear, accessories and everything in between. A quintessentially British brand, Ted Baker is famed for its quirky yet commercial fashion offering, high quality design detailing and distinctive use of pattern and color. The brand's unconventional approach to fashion, irreverent sense of humor and, above all, unswerving attention to detail appeals to style-conscious men who trust Ted to deliver that certain something out of the ordinary. 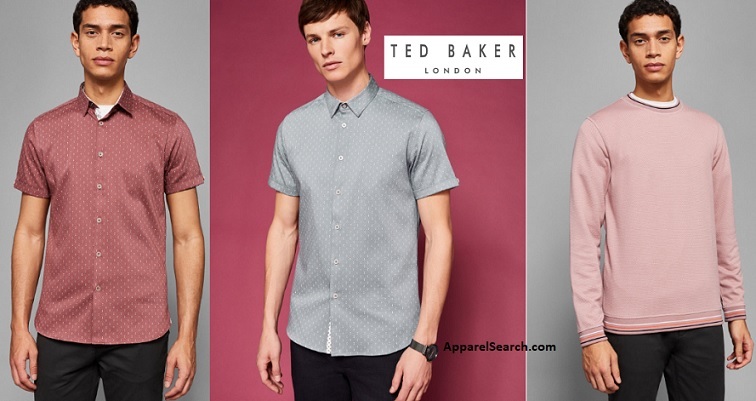 Learn more about the men's Ted Baker clothing brand. Ted Baker has grown steadily from its origins as a single shirt specialist store in Glasgow to the global lifestyle brand it is today. They offer a wide range of collections including Menswear, Womenswear, Formal, Accessories, Born by Ted Baker, Lingerie and Sleepwear; Childrenswear; Fragrance and Skinwear; Footwear; Neckwear; Eyewear; and Watches. If you have changed your mind and do not wish to research the brand Ted Baker, you can use the search engine on this page to find another clothing label that may be of more interest. Apparel Search is a leading guide to fashion, style, clothing, glam and all things relevant to apparel. We hope that you find this Ted Baker page to be helpful.